March 1-3, 2013: Grease is the Word! The following map was created using the Trimble Outdoors Navigator app for my iPhone. For an interactive version of the map or to see a closeup of the route, click the “Bigger Map” link. We wanted to get away for the weekend to relax from the strain of several circumstances as of late. Between work, family concerns, household projects, due to lack of time, we haven’t allowed ourselves a road trip for a while and we were long overdue! We just had a few days, so we couldn’t travel too far and we kicked around several possibilities. Looking at the map, I suggested that we continue following the Great River Road, south from St. Louis. We had previously followed it from Minnesota, along Wisconsin and Illinois, as well as some in Illinois north of St. Louis. So, we thought we’d take it south from St. Louis and see if we could reach Memphis and partake in hamburgers from Dyer’s Burgers. We saw Dyer’s featured on the Travel Channel’s show “Food Paradise,” on the “Deep Fried” episode. Dyer’s features hamburgers deep fried in oil, but what makes them unique is the fact that there oil is never completely discarded, only strained and added to. Therefore, Dyer’s claim to fame is that the grease/oil contains 100+- year old grease molecules. Grease is most certainly the word! We started our journey on Friday afternoon from the east side of Indianapolis, after having a late lunch/early dinner at Edward’s Drive-In. We cruised the Evil-I for a while, and took US 40 west from the west side of Indy. We turned south on US 231. We took a little stretch of the new I-69 until we reached US 50. We took US 50, until we reached Olney, Illinois. We stayed at a mom & pop called the Traveler’s Inn Motel, which had definitely seen better days. The thermostat didn’t work, and it felt like 1000 degrees in there. We opened the door and window for a while, but the relief was short-lived. Pat ended up turning the wall AC on. The room had an odd configuration, there was another door in the room, which I assumed had another door on the other side (adjoining rooms, but that have locked doors between them). But actually, the door only locked on our side! We were a little confused, and assumed that room had to be ours or else anyone could just enter the other room! It was cooler in there too, but we opted to stay in our part in case we were wrong. We went to the other side in the morning, and found that its outside door had no number, so we knew it had to have been our room as well. It had two double beds and a kitchenette. Still, not the best of places, but serviceable. Before heading out early, we luckily had the benefit of early light due to central time. 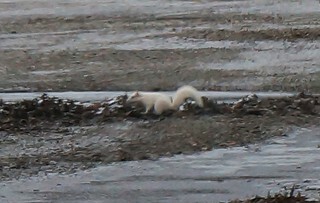 As Olney was the “Home of the Albino Squirrels” we couldn’t pass up the opportunity to take a peek at one if possible! But first, I needed coffee, so we stopped at a cute little coffee shop in town, called Ophelia’s Cup. Great cup of coffee!! Pat got a hot chocolate, and we were off in search of albino squirrels. We continued our southwesterly trek until we reached the Great River Road in Chester, Illinois. To our surprise and delight, Chester was home to Popeye the Sailor Man! How cool is that? 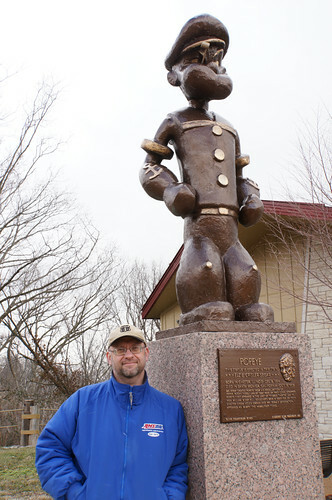 Chester is the hometown of Popeye’s creator, cartoonist E. C. Segar. We came upon a park with some murals and statues, and found that there is a statue trail for the various characters. next to the park was a Popeye store and museum called Spinach Can Collectibles – very cool shop with TONS of Popeye collectibles and memorabilia. We debated about getting our grandson a Popeye doll, but at 2 and totally unfamiliar with the cartoon, I didn’t think he’d appreciate it. Instead, Pat picked up a Popeye magnet and I opted for a DVD of the 1980 movie, “Popeye” starring Robin Williams as Popeye and Shelly Duvall as Olive Oyl. That was a favorite of mine and my dad’s, so I had to get it. 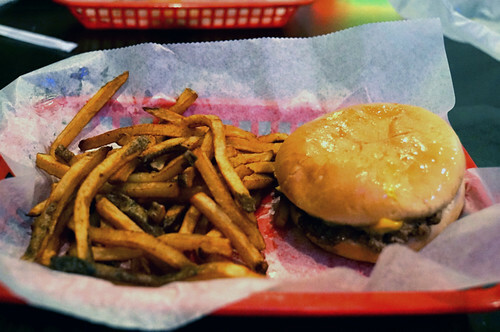 We continued down the Great River Road, and could have kept the slower pace we enjoy, but ultimately we decided that we really wanted to have the burgers at Dyer’s in Memphis and we would not make it without unfortunately, taking the Evil-I! We picked up I-55, and journeyed south toward Memphis, destination: Beale Street. The area was fairly easy to navigate, though we didn’t find any street parking, so we opted to park in a garage close to Beale Street. 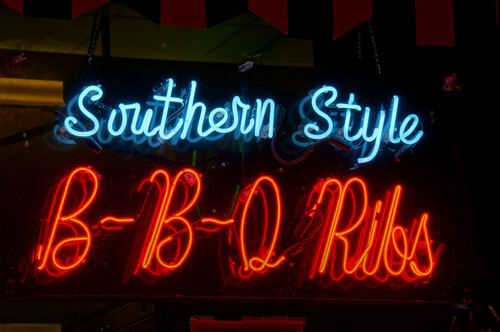 We made the short walk to Dyer’s Burgers and were entranced with the abundance of cool neon! But first thing was our grease fix. We each ordered single burgers, and I selected French fries with mine while Pat decided on onion rings. The burgers were pretty good though we have had better, flavor-wise. Being deep fried certainly made them moist and I did enjoy the fries a lot! We decided we had just enough room to split a dessert, a deep fried peanut butter & jelly sandwich (a Smuckers Crustable). 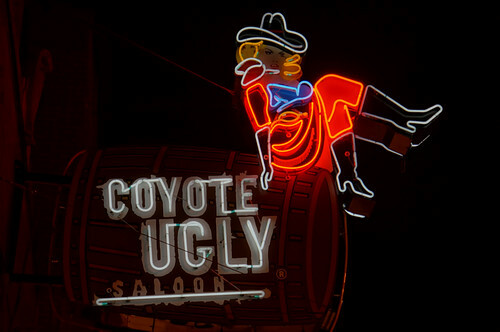 After satisfying our stomachs, we went out to satisfy my need to use my new Sony NEX-6 for some neon photos. Not disappointed at all! I used the HDR feature, which really helped to make the exposure simulate what our eyes see. In HDR mode, the camera brackets 6 exposures and combines them within 10 or seconds, yielding a result that is just spectacular. The camera retains the original photo, as I exposed it and the combined exposure. I deleted all of the original exposures, but I will at some point retain a few and post them for viewing to show the before and after. I thought that the HDR feature would be helpful in cutting down my workflow, and allowing me to get my photos processed and uploaded faster by editing on my iPad Mini if needed. I’m happy that only minimal post processing is needed, the camera does a fabulous job processing. I do have an app called Photogene on my iPad Mini which does well handling any minor edits or cropping I need to do, but is fairly well featured enough to handle more if needed (no substitute for Photoshop of course but it’s still a good app!). 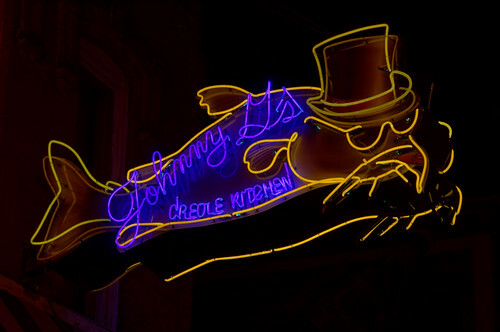 Here is a sample of photos from Beale Street. See the slide show below for all of the photos or click the slide show to go to my Flickr site. We headed southeast out of Memphis, opting to move on for a place to stay the night. We crossed into Mississippi, and the town of Corinth seemed like a reasonably sized burg, but was an hour or so away, and we were getting pretty tired. The small town of Holly Springs was much closer, and had a few choices, and an EconoLodge that used to be a Hampton Inn had good reviews, so we opted to stay there for the night. The hotel had a decent continental breakfast, so we decided to partake in a little complimentary food before moving on. We headed east on SR 4, and north on SR 5, before picking back up US 72. We continued on US 72 until we crossed into Alabama, then took the Natchez Trace Parkway north to its northern terminus just southeast of Nashville. 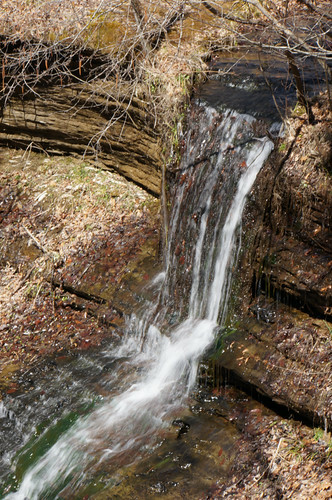 We stopped at a few scenic locations, one being Fall Hollow Waterfall. In Nashville, we decided we needed to again take the Evil-I so we could get home at a fairly reasonable hour, so we took I-65 north back to Indy. Our final stop was for dinner at Toot’s restaurant in Bowling Green, Kentucky, where first timers receive a complimentary order of fried pickles. We had potato skins as well and I went with the Philly Cheesesteak and Pat ordered a rack of ribs. With yet more grease ingested, we waddled out of there feeling overfull and headed home.